The code comes in two main pieces (head section & body section) and a third piece is an add on if more menu items are needed. I will show only the first two. If third is used, just make the same modifications to it as shown. 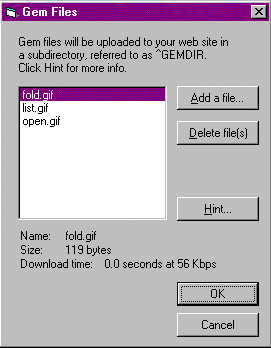 Right click and choose Save As on each of these links to download the actual stored gif image file. Place the image in a file where you can find it later. You can also just click the link to see the image file. Place both the head and body codes into one document in an editor program (Notepad, etc). I have made notes in code below and it will effect functionality! Use the Select All choice above! Sample menu - links are all going to same test fdddf page! Menu is placed in 1st column (with white background) of 2 column table. Without further modification, links open in same window. This menu works well published with and without frames. Should be typed like: target="TRLX_Middle"
"_top" - The linked page will open in the entire existing browser window. "_blank" - The linked page will open in a new browser window. "_self" - The linked page will open in the same page area (frame) as the link. "_parent" - The linked page will open in the parent frameset. If there is no parent frameset the link will open in the whole browser window. This works only for pages with nested frames. "TRLX_Middle" - The target page will open in the Page Body, or middle, of the link's page. "_search" (IE5+) - If your user is browsing with Internet Explorer 5 or later, the destination page will open in the Search pane on the left side of the Internet Explorer window. "_media" (IE6+) - If your user is browsing with Internet Explorer 6 or later, the destination page will open in the Media pane on the left side of the Internet Explorer window.